From the 18th to the 23rd September, the world’s leading trade fair showed the entire range of modern metalworking technology and hosted over 2,200 exhibitors. Up to 150,000 trade visitors from more than 100 countries visited the exhibition halls and were impressed by the latest machines and technical solutions. Under the key topic “Connecting Systems for Intelligent Production”, most exhibitors have shown very concrete solutions. 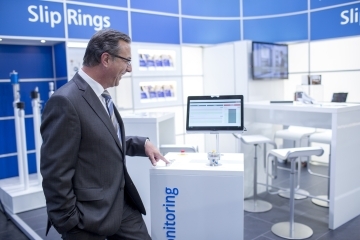 We were also able to convince many prospects and customers with our highlight the “Condition Monitoring Booth”. Specifically with the example of a single-channel rotary union ROTODISK S with integrated condition monitoring, we were able to demonstrate how the temperature and vibration sensors and a software specially developed by GAT can be used to monitor the operating state. This allows the user to optimize the planning of the maintenance intervals. We look back on a very successful trade fair participation. Many visitors signaled with concrete projects that they want to cooperate with us. We would like to thank all visitors and hope to see you again at the EMO 2019! Take advantage of the opportunity to participate in our sweepstake and win a luxury weekend in the Rheingau region – home of GAT. The deadline is 31.10.2017.